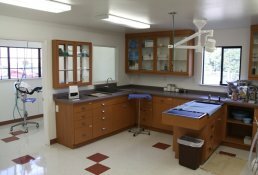 Country setting with facilities for large and small animal veterinary care. Dr. Hagus grew up on a Thoroughbred horse ranch in Cottonwood, California and showed Angus cattle before attending Veterinary school at U.C. Davis. 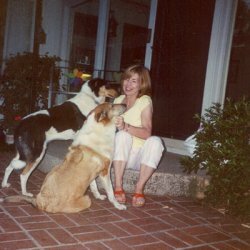 She did her internship and residency at Texas A&M University and practiced in the Virginia horse country for two years before opening her own practice in Fresno. She has two Smooth Collies, Flopsy and Mopsy and seven cats including two persians. Large and small animal veterinary care offered at the clinic. Ranch call service provided by appointment for horses and cattle. Cats, Dogs, Horses, Cattle, Sheep, Goats, Pigs, and Deer. Horse Owners - For up-to-date information on horse health please go to www.myHorseMatters.com where you will find dozens of articles about topics from nutrition to lameness, a question-and-answer forum with a member veterinarian, listings of owner educational events and a bi-monthly e-zine. Cattle Owners- Visit www.beefcowcalf.com for up to date information on beef cattle.